“By later today, the #MendocinoComplex will likely become the largest wildfire incident in California history. “Of course this isn't just happening in California. Map of Mendocino Complex fires below. Heat and winds are returning. And a Yosemite resort was destroyed. As of this morning, the #MendocinoComplex is the first wildfire incident in California state history to surpass 300,000 acres. That's the same size as the land area of the entire city of Los Angeles. CAL FIRE info and map at the link. Numb to it all now. It seems California is toast. Makes my fire-prone British Columbia look tame in comparison. Are you sure that 3th pic is not fake ? Anyway, it looks impressive. Looks like hell on earth. GIF map at the link. the third picture is looking at the fire with the setting sun behind it. 40-second video from tanker plane at the link.
" ... we showed that wildfire in boreal peatlands within the discontinuous permafrost zone cause permafrost thaw through active layer deepening and talik expansion on peat plateaus, but also through accelerated thermokarst bog development along peat plateau edges." " ... permafrost thaw at the edges of peat plateaus (i.e. thermokarst bog development) is considered irreversible given that these ecosystems undergo a complete successional shift to a new vegetation community that also includes strongly altered soil thermal and hydrological regimes." "We estimated the total peat plateau loss to 9800 ± 4100 km^2 (95% CI), of which 2200 ± 1500 km^2 , or ~23%, was directly attributed to the increased rate of thermokarst bog development that occurs following wildfire." Caveat: "It is not clear from this study whether the role of wildfire as a driver of thermokarst bog expansion has become relatively more important ..."
Yeah we need a new name for Glacier national park. Also for the Sierra Nevada. Death valley will probably be fine. Heavy smoke from wildfires drifts across northwest U.S. Image below; GIF at the link. Image below. Tesla Model X “Biohazard” air filter control pic at the link. Smoke from California and Canada wildfires now extends all the way to Europe. It is curious that we both know who was responsible for the fire and the cause is still unknown! It's official: the prescribed burn in the East Point, Florida area caused the devastating fire in East Point. The intentional fire smoldered for 'several days' before strong winds re-ignited it, to disastrous effect. Didn't Smokey the Bear teach us to leave fires out cold? A father and son made a mad dash "through hell" in the middle of a blazing forest fire while driving down a winding mountain road in Glacier National Park in Montana -- and have it all caught on a harrowing video. The #MendocinoComplex is now the first 400,000+ acre [162,900+ hectares] wildfire incident in California history. A few days ago, it became the first 300,000+ acre wildfire incident in California history. There's simply never been a fire like this as long as we've been keeping track. First Yosemite, then Glacier, now Olympic National Forest -- a wildfire is burning in a rainforest right now -- one of the rainiest places in the continental United States. It is expected to burn until the wintertime rains arrive. Wildfires are another example of climate change that seems to affect “other areas, not where I live” — until it hits home. Seattle’s air quality is as bad as smoking 7 cigarettes. Blame wildfires. Ash and smoke are choking Seattle’s air for the second week in a row, as wildfires smolder in the Cascades and in British Columbia. As of Tuesday morning, the Air Quality Index in Seattle was at 181, a rating classified as “unhealthy.” In parts of the city, the index rose as high as 220, which is “very unhealthy.” To put it in perspective, an AQI of 150 is roughly equal to smoking seven cigarettes in a day. That means residents should avoid being outside and exerting themselves, particularly people with heart and lung problems, the elderly, and children. On August 15, many noted that air quality in Seattle was worse than in Beijing, one of the world’s most notoriously polluted cities. The flames from some of the massive wildfires that have raged from Alaska to New Mexico have destroyed homes and taken lives, but the smoke and ash in the air are one of the most insidious threats to health. Since nearly 2 million acres have burned in the United States this year from 109 fires in 12 states ranging from Alaska to New Mexico, many regions are affected. Wildfires have ignited in the Pacific Northwest before, but usually Seattle’s weather quenches flames and clears smoke pretty quickly. That the region has remained so hot and dry this year, allowing smoke to linger, is highly unusual, Andrew Wineke, a spokesperson for the state Ecology Department’s air quality program, told Q13 Fox. But it also happened last year. 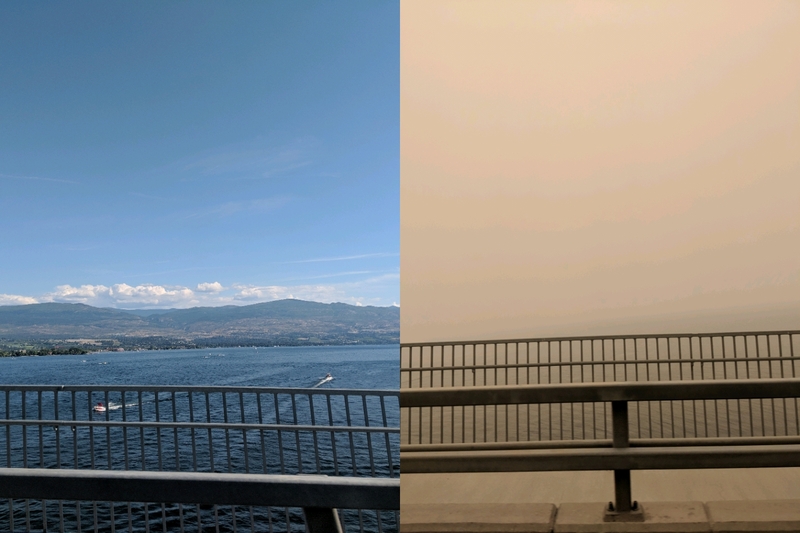 With nearly 600 fires raging across British Columbia, communities are on evacuation alert, many are choking on smoke, and especially northern ones are saying the province’s recently-announced state of emergency comes very late in the day. Since the Horgan government declared a province-wide state of emergency last week, nearly 40 new blazes have erupted, “mostly sparked by lightning,” CBC reports. Truckers abandoned big-rigs and motorists screamed in fear as they came dangerously close to an explosive wildfire that shut down about 45 miles of a major California interstate near the Oregon border that authorities were desperately trying to reopen. In a video, a passenger in a vehicle screams: “Oh my God, I want to go!” as nearby trees burst into flames. Interstate 5 remains closed in Shasta County because of a fast-moving wildfire. The Delta Fire is burning about ten miles north of Redding. So far, the fire has grown to 23 square miles and has zero percent containment. It was 8 square miles on Wednesday. Caltrans says there are no plans to reopen I-5 north of Redding on Thursday night and will re-evaluate on Friday morning. Probably not wildfires. But it's pretty clear that the rainforest are burning. ...the company was purging the pipeline of natural gas and would inject it with nitrogen to extinguish the fire in the vault. There is presently not a risk of an explosion, officials said, but residents were evacuated for their safety. "Until that fire is extinguished, we're not comfortable that truly there is no chance that there could be a catastrophic failure" of the pipe, Carey said. "So in the abundance of caution four our citizens and our personnel, we've chosen to keep the evacuation order in effect until that is truly mitigated." #CampFire black out conditions, vehicles can't move. Many trapped. Fire is at Pentz Rd, Skyway, Forest Glen, If you're anywhere in front of the fire GET OUT NOW before it's too late! #CampFire is growing at an estimated rate of 80 football fields PER MINUTE. Conditions are nearly ideal for explosive fire growth in Northern California today, at the peak of fall wildfire season. Record or near-record dry vegetation + strong and dry offshore winds. A nightmare. 10-second vid at the link. 30-sec video at the link: fire just behind houses on residential street. Caution: language. Fueled by winds of up to 50 mph, a 5,000-acre fire threatened the town of Paradise in Butte County Thursday morning, prompting the mandatory evacuation of large sections of the town of about 26,000 people. At least two California Highway Patrol units had their vehicles disabled and surrounded by fire, having to escape on foot, according to live dispatch radio traffic available on Broadcastify.com. The dispatcher can be heard sending fire crews to assist the officers at about 9:45 a.m. The fire and evacuations led to gridlock traffic on Skyway in Paradise, with dispatch radio traffic indicating multiple civilians had also abandoned their vehicles. Several fire officials reported flames were about 15 yards from major roadways about 9:45 a.m.
Butte is one of eight counties in which Pacific Gas and Electric Co. has announced a potential planned power shutoff event that could begin Thursday. PG&E announced the possible shutoff earlier this week in light of forecasts for high winds and dry conditions creating high fire risk in a large portion of Northern California. National Weather Service issued a Red Flag Warning, in place Wednesday night through the end of the week. NWS Bay Area on Twitter: "1-minute satellite imagery from GOES-East of #CampFire smoke plume from 10:32 to 10:51 am PST. Note the southwestward progression of the plume as a result of the northeast winds aloft. #CAwx #RedFlagWarning https://t.co/WHvo9kyyBX"
GIF at the link shows startlingly fast advancement of the smoke plume. #CampFire dozers given permission to move cars off the roadway if they're blocking it. Paradise, California is a town of 27,000 people. Evacuations have been ordered stretching almost to Oroville. Other fires have broken out farther south in California, closer to the coast in Ventura County. Fire has jumped the 101 freeway. Evacuations underway. Alex Lamers on Twitter: "Holy moly. 8000+ acres in an hour and a half. #HillFire https://t.co/TZQtKyO8bd"
CA Fire Scanner on Twitter: "#HillFire (Ventura Co) - 3,500-4,000 structures threatened along w/ immediate life threat." CA Fire Scanner on Twitter: "#WoolseyFire (Simi Valley) - IC reports fire is now 600 acres." CA Fire Scanner on Twitter: "South Ops advising no more air tankers are available.. #HillFire #WoolseyFire"
#WoolseyFire = Simi Valley spreading towards Oak Park." NWS Los Angeles on Twitter: "Current conditions near #HillFire: Temp 78, Relative humidity 10%, Wind NE 15G25 MPH. #SantaAnaWinds will increase this evening and overnight. #cawx"
Video of fast-spreading fire along Highway 101. Video of air tanker dropping fire retardant. - #CampFire Clark x/Skyway units advising they're running out of water, need water tenders. They have 150 people in a building with several buildings and a gas station on fire next to it. - #CampFire sending strike teams of engines to help, 10 engines. Clark x/Skyway. Thanks for following & posting this Sigmetnow. This evacuation warning does not include the City of Chico #ButteSheriff #CampFire"
Continual updates on the CAMP fire in Paradise/nearing Chico at the above link. Firefighters worked Thursday night to prevent the Camp Fire from burning into Chico, although flames destroyed homes on the outskirts. Evacuations extended to the north (Magalia). 15,000 structures threatened. 20,000 acres. The entire city of Malibu [California] was ordered evacuated early Friday as a ferocious Southern California's wildfire roared toward the beachside community that is home for many Hollywood celebrities. I'm 100 miles, as the crow flies, southwest of the Camp Fire. Smoke is so bad here schools have closed for the day. While we're in no danger from the fire, we had ours in October 2017 that burned many places in Sonoma, Mendocino, Lake and Napa counties to the ground. Nerves are frayed. Best to those in danger, evacuating and fighting this monster. A future with AGW will create more opportunities for carnage and heart break like this. His narration was interesting re: how one woman allegedly had to get made-up before leaving. She died because of it. Now called the Hill Fire, the Southern California blaze broke out at 2pm on Thursday and has so far scorched 10,000 acres as it makes its way toward the Navy's sprawling air base located along the coast near Camarillo, California. An optional evacuation notice has turned into a mandatory one this evening as the commander that has purview over Naval Air Station Point Magu saw no other choice but to get his people to safety in case the fire, which has been whipped up by high winds, blitzes into the installation. Even more pressing is the status of an important radar telemetry and communications station on nearby Laguna Peak. This facility provides surveillance and support for Point Mugu Range Complex and SOCAL Range Comlex activities and also does critical space tracking work. Laguna Peak, which looks over the air base, seems at great high risk here—that is if it is still intact. As of 8pm, the facility was given high priority and water tenders were moving up the hill to help keep the flames at bay as the water tanks on site were empty. Image with peak wind gusts at the link.